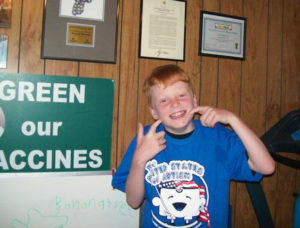 The first pictures of the United States of Autism t-shirts on our fans came in from Iowa and the Wessels family. Be sure to check out the gallery below as their son, Sam, models the shirts for us. We think so, and we’re proud to have him as the first of many showcasing t-shirts from around the nation. So proud of you Sam! I can’t WAIT to see the film! !